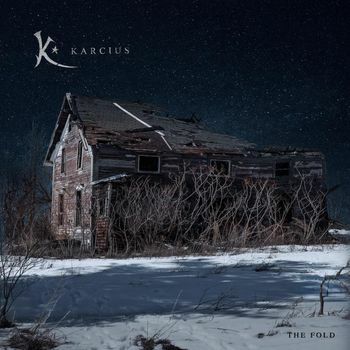 The Fold is the fifth full length recording from Montreal based art-rock band Karcius. Described as a concept album, it explores the relationship of perception, reality and dementia. This represents something of a development for a band which originally started out as something of a jazz-fusion instrumental band, but which changed direction with the addition of Sylvain Auclair on bass and vocals for 2012s release The First Day. The trio of Auclair, Simon L'Esperance on guitar and Thomas Brodeur on drums provide the compositional core of the band and are augmented by keyboards from Sebastien Cloutier. These musicians certainly know their way around, producing a cinematic experience. The augmentation of a string quartet allows for a range of tones and contrasts in what is a stunning aural experience. L'Esperance in particular produces some stellar guitar work on every track, while Auclair's vocals range from the plaintively emotional on the haunting Goodbye to growling prog-metal on tracks like Something and The Fold. The first two of those in particular will draw comparisons to Steven Wilson and they will not be totally out of place in the company of that august presence. The bold experimentation of Hardwired is also to be applauded with its opening bars almost reminiscent of Gregorian Chant. The ensemble really comes together on the instrumental sections of Goodbye, a particular highlight being the frantic guitar, synth and drum section stripping away to reveal Auclair's sensitive bass playing, overlayed with mandolin and a majestic wash of guitar. The eastern tones of Burning My Dreams effectively brush alongside the metal style guitar work in a kaleidoscope of sound and stunning contrast. This is an engaging, innovative, experimental album of great musicianship, variety and scope. I had never come across Karcius before, but if this is the direction they are taking for the future, they are a welcome addition to the neo-prog scene. Having landed spots supporting Gong and Nick Mason's Saucerful Of Secrets they are already keeping good company and attracting attention. For a self-produced album, this is an excellent release and perhaps one of my favourite releases for quite some time. The six tracks showcase the high quality of the band and demonstrate what they are capable of with no drop in quality throughout. It is evident that in the making of The Fold Karcius hit a rich creative seam. As L'Esperance commentated “The more the story elaborated, the clearer we understood where it took place and what purpose the characters within this universe served, the more we realized what a unique concept we were holding in our hands.” Anyone who likes prog-metal or Steven Wilson should give this a listen, I guarantee you won't be disappointed.